Oops. Slashdot looks like it’s carrying some serious Aljazeera ads in their rss feed with Google Adsense. 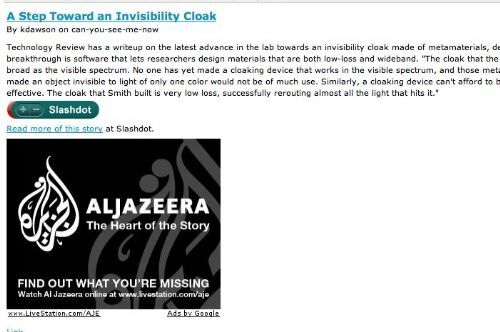 At first I thought it was a fluke, but every other article or so on Slashdot itself is showing an Aljazeera ad at this time. Figured I’d flag it for amusement purposes. Wonder if they’ll put it in their blacklist at some point or if it’s intentional. Either way, it’s pretty interesting that it just showed up tonight as far as I can tell. Would you object if they were running BBC ads? Aljazeera has the same rights to advertise as anyone else. We should be able to decide if their content is truthful or not. Personally, I enjoy hearing an International viewpoint. I recall as a child hearing about mountain climbing in Cuba over shortwave radio. Even then, I knew enough to realize Cuba barely had anything higher than a few hundred feet – hardly a mountain.